I have been using Tamrac bags for quite a while. My first and most favorite bag (until now) was the old Tamrac Adventurer bag. It got me through quite a few Workshops and, as the name implies, adventures. However, as my kit has grown and my travels have become more frequent, I have been in the market for a new camera bag. 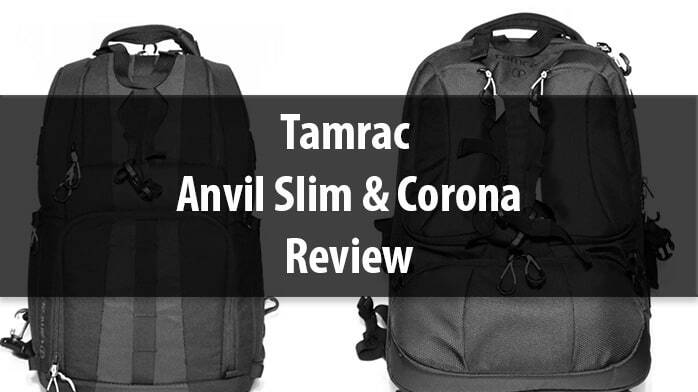 I narrowed my search down to the Tamrac Anvil Slim 15 and the Corona 20, both of which are great bags, but for very different reasons. Before we take a look at these particular bags, I want to take the time to talk about camera bags in general. I own several bags, more than I can count, I think, and I have come to terms with the type of bag that best suits me. I have used sling bags, backpack slings, messenger slings and true backpack style bags. My favorite has to be the latter. For years I carried around a Domke Ruggedware Military bag. At first, I loved the bag, and in many ways I still do, but the messenger style bag is a shoulder breaker on long hikes. As a matter of fact, hiking through Yosemite with that bag and all my gear may have required a visit to the Chiropractor. It is not a practical way to carry a lot of gear over a long period. Coming to terms with the inability to hike with the Domke, led me to revert to my Tamrac Adventurer bag. An old bag yes, but a trusted one indeed. It could fit quite a bit of gear in it, and it’s true backpack style made it comfortable along the way. The only problem was the improper use of space. I found myself carrying my zoom lenses in the top compartment out of necessity while in Yosemite. That probably wasn’t the best idea I have ever had as the top compartment does not have a great deal of padding. Enter the Anvil Slim 15. My first run in with the bag came at the Out of Chicago seminar where I had ample time to inspect the bag prior to making a decision. My first impression was, “Tamrac nailed the design of this backpack!” Moving down the table I caught a glimpse of the Corona 20 and had to have a closer look. For the most part, these bags are almost identically constructed, as far as craftsmanship is concerned. For the review I will be focusing on both bags when I refer to construction. Toward the end, I will branch off and discuss who each bag is for. The first thing I look at when I pick up a camera bag is the construction. It may be the former FAA Master Parachute Rigger in me, who knows. I can spot shotty construction in a matter of seconds. After looking over the Tamrac bags with a fine-toothed comb, I am confident they will hold up even with a fully packed bag. Tamrac used some of the best materials in the industry in the construction of the Anvil and Corona Bags. From the lightweight, but durable Cordura to the heavy duty webbing, they didn’t go slim on their fabric decisions. Some of my favorite aspects of the bag are the fastex buckles they used on the chest strap and the slick finger hole zippers that glide right around the bag as you open it. The addition of multiple Molle Sections is a very nice touch as well. If you are unfamiliar with Molle, it is a type of webbing construction added to back packs that allow for modular additions to the bag. With the Molle sections on the camera bag, you can add “free” bags to the main camera bag with velcro or button straps. The Tamrac bags are outfitted with everything you’d expect in a camera bag and then some. Both bags have modular Velcro dividers so you can setup the bag to fit your individual needs. Tamrac also included two elastic bands (one in the Corona 20) to hold in those heavy duty lenses that tend to shift around in their larger demanded sections. In addition to the modular design (something we have grown to expect in camera bags), Tamrac added an optional waist strap. In everyday use, the waist strap may not be necessary, but for long hikes, it is almost mandatory. It helps relieve a lot of weight from your back and cinches it closer to your body, so it doesn’t move around as freely. I like having the ability to remove it when I am going on short jaunts as the waist straps on bags tend to get in the way if they are not worn at all times. Tamrac also includes a rain cover that fits snugly around the entire bag. I could have used that in Yosemite in May. Between getting soaked by waterfalls and stuck in a downpour on Glacier Point, my bag was rarely dry. Someone with a lot of gear. Someone who prefers a true backpack style bag. Someone who goes on long hikes. Someone with a small camera kit. The Sling type bag owners will love this! Someone who doesn’t go on long hikes to get their shots. Someone who prefers to travel light. Built for quick access, lite gear loads, and shorter trips. 1. Goal Zero Charger. Anyone with a Sony Mirrorless will understand! 24. Bean Bag for ultra low angle shots. Talk about coincidence! Just 24hrs ago I upgraded my camera bag to a Tamrac Anvil 23. Should be inough to my trip to North west Iceland at the end of the month. Loved the review, in fact if I’d seen it prior to my shopping trip I would not have spent an hour (or more!) choosing the right one. B Regards. Looking at everything you put in there I can see why the name ‘anvil’ may be appropriate! LOL! I like the way you included images to help show the details. Since I hike overnight to locations, I have a camera backpack for my gear AND overnight stuff. I’m using a Mindshift Gear Rotation bag which works well for me. I’ll probably add their largest version for expeditions into Alaska. My Tamrac Adventure 9 was used for a few years successfully and it still looks like new and it’s been to several 14,000 foot peaks and through the deserts of the south west. So I can attest to their ruggedness. I suspect the strap you are talking about is a “waist” strap (to go around your mid-section) and not a “waste” strap to throw away. Correct. Thanks. I updated the post. Which Goal Zero charger is iThere are so many of them.t you carry?